After a brief hiatus, I’m back with my Gimmick or Good? 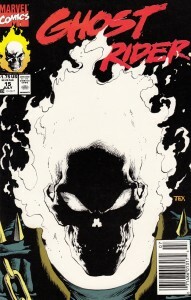 column at Comics Should Be Good, this time looking at one of the most famous books of the 90s: Ghost Rider #15 by Howard Mackie and Mark Texeira. This comic is Marvel’s very first glow-in-the-dark cover and is a part of the very popular Mackie/Tex run that helped make Ghost Rider a white hot property in the 1990s. Please check out my article and find out if I thought Ghost Rider #15 was a gimmick or was good. Many moons ago I purchased and few copies of Ghost Rider #15 the “Glow-in-the-Dark” comic books and they are to this day the original 1st print books. They are not second prints, but one of them don’t have the glow-in-the dark laminate if you will? On it? So does this make that comic book worth more? I tried looking it up on the internet but so far nothing? Can you help me out here?